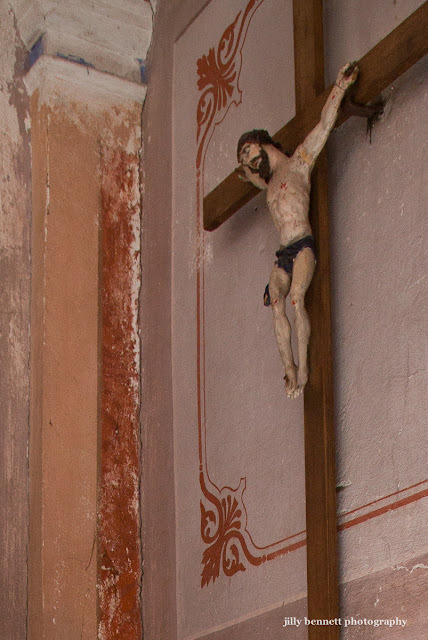 As you enter the Chapel des Penitents Blancs you'll find this small crucifix tucked high up in a corner. So beautifully and delicately made. It's perhaps a few centuries old. Imagine how surprised the sculptor would be if he knew his creation had been photographed and seen by others on the Internet, on a blog, on Facebook. Lorsque vous entrez dans la chapelle des Pénitents Blancs, vous voyez ce petit crucifix niché dans un coin en hauteur. Si joliment et délicatement ouvragé. Il date peut-être de quelques siècles. Imaginez quelle serait la surprise du sculpteur s'il apprenait que son oeuvre a été photographiée, et vue par tant de personnes sur Internet, sur un blog, sur Facebook. The thought you pose is amusing. However, such beautiful pieces of preserved history help to anchor us in this fast-paced crazy world. Bonne journee. Elizabeth - it wasn't meant to be amusing. My failure! I meant the words to indicate exactly that, the difference between the beauty of the old and the craziness of our world now. It is the old and the beautiful in my village that I love and photograph so that others can see it. I agree all these things should be preserved and happily, at least in my part of France, they are. so much beautiful everywhere. Well France i slike that of course! How lucky we are.